Khabib eyeing up Abu Dhabi return against winner of Interim title fight. 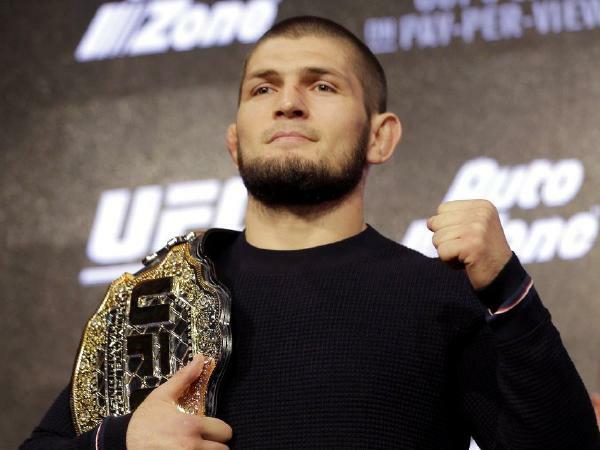 UFC lightweight champion Khabib Nurmagomedov has said that he is in talks to return to the cage and headline a UFC event in the United Arab Emirates capital of Abu Dhabi in September. Nurmagomedov was at the Plekhanov Russian University of Economics on Tuesday and told RT Sport about a possible return and likely opponent. “Yes, we are working on this,” Nurmagomedov confirmed. “UFC told me that they are working on this. I just came back from Dubai. And very soon news is coming. Very soon,” he added. Nurmagomedov has one condition, which could be a stumbling block, in that he wants his suspended teammates Zubaira Tukgugov and his cousin Abubakar Nurmagomedov to either fight before he returns or return on the same card as himself. Both are serving one-year bans due to their involvement in the aftermath of the Khabib-McGregor bout at UFC 229. “[Tukgugov and Abubakar] either have to fight with me on the same event or before me, it is the main term of my comeback,” he said. Nurmagomedov also stated he expects to face the winner of the Interim title match up between Max Holloway and Dustin Poirier. Nurmagomedov was then asked about which of the two fighters he would prefer to face. “Holloway has a 13-fight winning streak, if he beats Poirier it will be 14 wins in a row, which is the longest active winning streak in the UFC, if he wins he will also be a two weight champion. Fans would also be more interested in a Holloway fight,” said Khabib. Would you be happy to see Khabib back and who would you prefer to see him matched up with?